Now after travelling 45,000 miles, and performing to over 170,000 people at 63 different venues, you would've thought Lee Evens would be able to walk on stage without -- THUNK -- falling over. But no. Not really. Still. What he does manage to do is talk to his live studio audience about: (1) Health. (2) Sanitation. (3) Sports. (4) Parenting. (5) Shopping. (6) Restaurants. (7) Travelling. (8) As well as demonstrate plate-spinning, and how a well-paid boss gives himself a raise. Yeah. I kid you not, comedy fans. Here. Check this out for some of the stuff Lee comes up with during his last show, held at London's Lyceum Theater. Hi Doc. Hello. Bend your knee. ARRRGHHH! No. The other way. I bought a relaxation tape with the sound of the waves on it, yet when I turned it on, I heard nothing. So I took it back to the shop and asked the chap behind the counter what was going on. He said 'Well, the tide must have gone out'. I've got to stop biting my nails at its really damaging my teeth. More importantly, I've got to learn to take my shoes off first. I rang the shopping channel, and the voice on the other end asked me if I needed any help. I said 'No. I'm just browsing'. I should be more imaginative with my language, but f*ck it. Is it just me, or do you look uglier the more you look at yourself in the mirror? Oh! It must be just me then. When I was a kid I was crap at the egg and spoon race. Once I was so late I ended up running with a chicken. I bought a water purifier the other day -- shat in it -- and said 'Sort that lot out, pal'. American's have 'TGI Fridays', so we in England should have 'Crappy Old Mondays'. You will never get an enthusiastic reception at a funeral parlor. On airplanes stewardesses always say 'Women and children first'. Sure. F*ck off. I surprised a burglar the other day. I burgled his f*cking house. Now in closing his show, Lee chases after a piano, sings a wonderful song, and then thanks everyone who helped him during his time on tour. Boy! What a nice looking monkey he is. Ogga-Ogga! 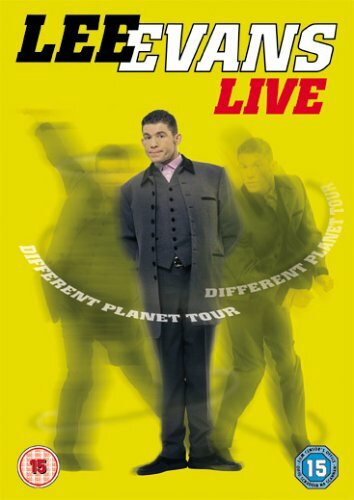 Now before I commence my review on 'Lee Evans: Different Planet Tour', I was asked by a mate of mine -- called Steve -- to start this off by elaborating on a conversation we both had a couple of days ago. STEVE: Why didn't you do it? Why didn't you write that story on your blog? ME: What? Do you mean the one where I slept with your Mother? I told you, I don't like denigrating the disabled in public! STEVE: Hey! Cut that out, you clown! You know what I'm talking about. 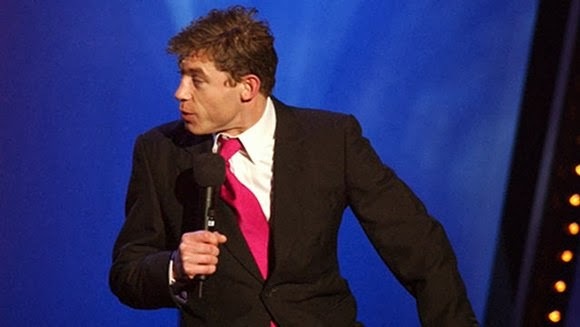 That time where you did a 'Lee Evans' during our school play! That was class, man. That would have summed you up, Lee up, and your opinions up, just perfectly (please click here to see what he's referring to). ME: Errr? Well, to be honest with you, Stevie-boy, it kind of skipped my mind. I totally forgot about it. STEVE: What? How could you have forgotten? You were 14. You were in a school play. You were supposed to be dancing to 'Raining Men' with me and the rest of our class. ME: Yeah... and what happened next? STEVE: Huh? You don't remember? Wow! You are a nut. All I have to say is one single word, funny-face... 'Chernobyl'. ME: Ohhhhhhhh! Yeahhhhh! Now I remember. But that wasn't funny! That was true! STEVE: You can't be serious, fool? ME: Think about it, Steve. The 'Weather Girl's' classic is an analogy for the Chernobyl nuclear disaster. Our teacher was telling us about it, correct? STEVE: Yeah. But not in the way you put it! ME: But it makes perfect sense. 'The temperature's rising' -- because of the nuclear fission. 'Barometer's getting low' -- for exactly the same reason. 'According to all sources' -- mainly the press. 'The street's the place to go' -- or in other words, 'face down in the street'. 'For the first time, in history, it's going to be raining men, BOOM!' -- case closed. STEVE: And so you then decided to tell the audience you 'theory' whilst we were all dancing to them. ME: Yeah. Felt like the right thing to do at the time. STEVE: Errrr... OK? I've got to go now. My brain's gone. Talking to you is like being on medication. Just remember to write about what we've just said when you do your next Lee Evans review. Got it? ME: Got it. Plus please give my best to your Mother. OK. So with that out of the way with -- thanks Steve -- how can I now sum up my feelings towards the 'Lee Evans: Different Planet Tour'? Well, to be honest with you, folks, I don't think I can. Not because it was a rubbish show. No. Far from it. It's just that I don't have the words within me to be subjective about it. You see, Lee is a very funny performer. That's a given. And he always manages to come up with new stuff whenever I see him on stage. Be it silly voices. Be it jovial melodies. Be it physical hi-jinks. One way or another I can always sense that Lee throws himself into his act like the rubber faced clown he is. So how can I debase him? Huh? How can a mumbling critic like myself even have the audacity to say a bad word against this great man? He's talented. He's naturally comical. He's musical. And even if I had just a fraction of his talent, I'd be a very-very happy mumbling critic bar none. Hey! I do apologize if the tone to this piece is a little off, folks. It's just that I honestly can't think of something de-constructive to say about Mr Evans that I haven't stated previously. Maybe it's because I see a lot of myself in Lee that's stops me from doing this. Me, the Lee Evans wannabe that always thought out of the box at school, and came up with lampoonish skits at the drop of a hat. I'm sure that's what my mate Steve would say, anyway. Yet, why can't I see it in myself? Answer on a post card please. Or alternatively, pick up a copy of this great taped performance and try to figure it out for yourself. Nuff said.